Prices of private residential properties in Singapore fell by 0.7 percent in the first quarter of 2016, compared to the 0.5 percent decline in the previous quarter, according to complete data released by the Urban Redevelopment Authority (URA) on Friday, 22 April. In the Outside Central Region (OCR), prices dropped by 1.3 percent after remaining unchanged in the previous quarter. Prices of non-landed properties in the Rest of Central Region (RCR) remained unchanged, compared to the previous 0.4 percent decline. Prices of non-landed properties in the Core Central Region (CCR) rose by 0.3 percent, compared to the previous 0.3 percent decline. 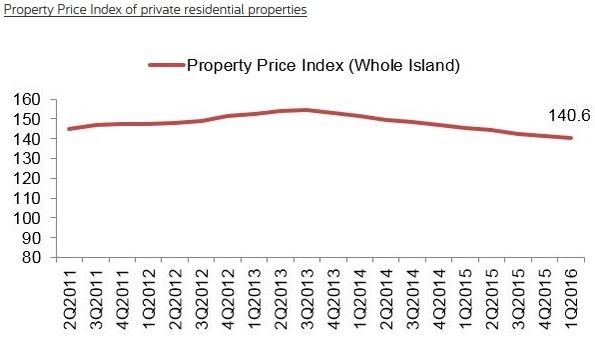 Prices of landed properties fell by 1.1 percent, compared to the 1.8 percent decrease in the previous quarter. Rentals of private residential properties fell by 1.3 percent in Q1 2016, the same rate of decline as in the previous quarter. Rental prices fell across all segments of the market. Rentals of non-landed properties fell by 1.7 percent in the CCR, 0.6 percent in the RCR and 1.2 percent in the OCR, compared to declines of 0.4 percent, 1.6 percent and 1.8 percent respectively in the previous quarter. Meanwhile, rentals of landed properties declined by 2.2 percent, compared with the 2.3 percent decline in the previous quarter. Excluding executive condominiums (ECs), developers launched 953 uncompleted private condos for sale in Q1, compared to the 1,333 units in the previous quarter. As for ECs, developers launched 534 units for sale, compared to the 505 units launched previously. Meanwhile, developers sold a total of 1,419 units, excluding ECs, in Q1, compared to the 1,603 units sold in the previous quarter. As for ECs, they sold 762 units over the same period, compared to 573 in the previous three-month period. Lewis Ng, Managing Director, PropertyGuru Singapore, said: “While the residential property market saw overall prices and transactions fall by 0.7 percent and 11 percent respectively, PropertyGuru saw an eight percent increase in queries for properties for sale over the same period. This entry was posted in Property Market / Real Estate and tagged Private Home Prices, PRIVATE RESIDENTIAL PROPERTIES, rental prices, Rentals of private residential property, Singapore Property Market. Bookmark the permalink.